When an avid gardener and seasoned quilt and stitchery designer combines her two passions, magic sprouts! 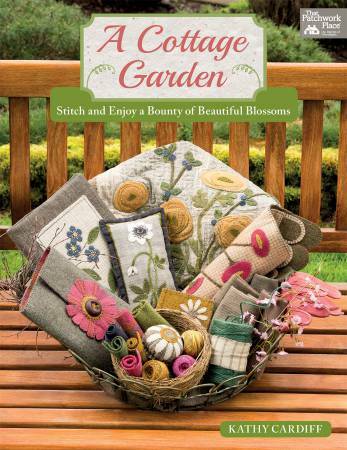 Using wool as her medium and flowers as her muse, Kathy Cardiff brings her blossoming backyard garden to life in projects that blend elegant beauty with a touch of primitive charm. Projects from pillows and sewing notions to table toppers and wall quilts culminate in a stunning nine-block sampler quilt bursting with blooms. Basic embroidery stitch details give each flower, leaf, and vine Kathy's special brand of cottage style. More than a dozen patterns feature easy wool applique and embroidery techniques. Packed with gorgeous photos of the garden that inspired each design. 96 pages and 2 pull-out pages.